Recently I visited one of Canada’s most beautiful and historically interesting locations: Quebec City. Today the skyline of Quebec City is dominated by a four star hotel; the Fairmont Le Château Frontenac. In September 1913 Thomas Christopher Monaghan, one of the heroes of the Hong Kong resistance, came to work as a clerk in this hotel, which was owned by the Canadian Pacific Railway. 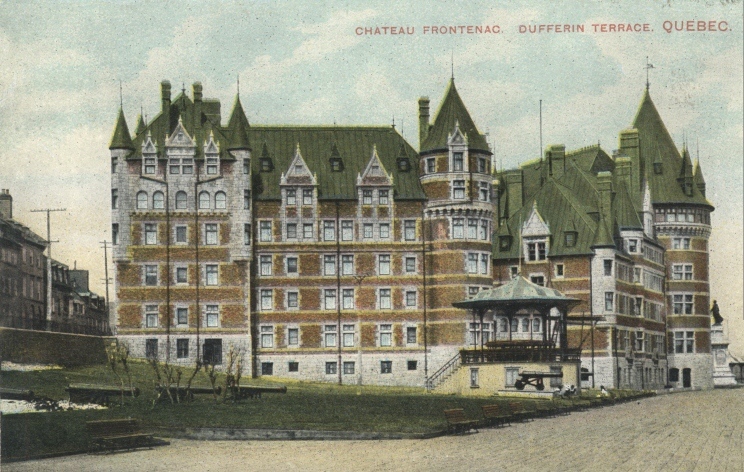 Quebec City was the first or last stop on a line that went all the way to the Pacific coast, and the company built the hotel as a way of suggesting the ‘romance’ of modern railway travel. Work started in 1892-1893; the design, which evokes the late mediaeval châteaux of the Loire valley, also did justice to the fact that in many ways Quebec City remained French. His company record, which I found in the National Archive of Canada in Ottawa, states that he left their employment for about a year in April 1917 – his resignation is marked ‘satisfactory’ so perhaps his absence has something to do with the Canadian participation in WW1, although this is only speculation. After returning in May 1918 he rose to Assistant Catering Manager (1920) and obviously continued to impress his employers as in October 1921 he was sent to Hong Kong as Catering Superintendent on almost double his previous salary. The central tower, which transformed the hotel’s appearance and the city skyline was added three years later in 1924. Mr. Monaghan’s father was a university lecturer who emigrated to build a new life in Canada. Irish emigrants played a crucial role in building Canada: between 1815 and 1845 half a million Irish people, mostly Protestant, moved to ‘British North America’, and they were followed by a third of a million more, this time largely Catholic, after the great famine of the 1840s (Carl Bridge & Kent Fedorowich, in Stephen Howe ed., The New Imperial Histories Reader, 2010, 149).I wonder if he chose Quebec City as his new home because of its vigorous Irish community? Sadly Mr. Monaghan did not live to see the liberation they were planning. He was executed for his courageous resistance work – mainly focused on helping people escape from Hong Kong – on October 29, 1943. Sadly there is no memorial in Hong Kong to the 33 people who died that day, nor, to the best of my knowledge, is there any rememberance of Mr. Monaghan in his home city in Canada.